Sounds like the trailer from the newly released movie, The Knowing, where a mega Sun flare destroys the Earth. It is midnight on 22 September 2012 and the skies above Manhattan are filled with a flickering curtain of colourful light. Few New Yorkers have seen the aurora this far south but their fascination is short-lived. Within a few seconds, electric bulbs dim and flicker, then become unusually bright for a fleeting moment. Then all the lights in the state go out. Within 90 seconds, the entire eastern half of the US is without power. A year later and millions of Americans are dead and the nation's infrastructure lies in tatters. The World Bank declares America a developing nation. Europe, Scandinavia, China and Japan are also struggling to recover from the same fateful event - a violent storm, 150 million kilometres away on the surface of the sun. It sounds ridiculous. Surely the sun couldn't create so profound a disaster on Earth. Yet an extraordinary report funded by NASA and issued by the US National Academy of Sciences (NAS) in January this year claims it could do just that. But this article is warning of the effects of electrical outages, something the charged tail of Planet X is expected to bring to the Earth during the hour of the pole shift, and increasingly as we approach the pole shift. The grids were not built to handle this sort of direct current electricity. The greatest danger is at the step-up and step-down transformers used to convert power from its transport voltage to domestically useful voltage. The increased DC current creates strong magnetic fields that saturate a transformer's magnetic core. The result is runaway current in the transformer's copper wiring, which rapidly heats up and melts. This is exactly what happened in the Canadian province of Quebec in March 1989, and six million people spent 9 hours without electricity. But things could get much, much worse than that. The most serious space weather event in history happened in 1859. It is known as the Carrington event, after the British amateur astronomer Richard Carrington, who was the first to note its cause: "two patches of intensely bright and white light" emanating from a large group of sunspots. The Carrington event comprised eight days of severe space weather. There were eyewitness accounts of stunning auroras, even at equatorial latitudes. The world's telegraph networks experienced severe disruptions, and Victorian magnetometers were driven off the scale. Right on cue, showing that NASA intends to have the electromagnetic bombardment from the tail of Planet X blamed on the Sun, is this article relating this effect to 2012, the end of the Mayan Calendar. Long scorned as "mysticism" and "parascience," concern about the year 2012 has now surfaced in a mainstream NASA report on the potential impacts on human society of solar flares anticipated to peak in 2012. Per the Zetas, it has long been the plan of the establishment to blame the Sun, but electrical disturbances going into the pole shift will not be caused by the Sun, they will be caused by the charged tail of Planet X.
ZetaTalk Prediction 1/15/1998: Alarms about solar flares are exaggerations. Solar flares will increase as the time of the passage approaches, but are in and of themselves not devastating. They, like the earthquakes that are on the increase, will increase in number, and plague electronic communications, but have little effect on the tides, growing seasons, or the weather. Those who would shield the populace from the truth of Planet X's approach will say otherwise, declaring that this is the cause of the increase in deep earthquakes, the chronic El Nino, and magnetic diffusion. It is not. It is just yet another symptom of the approach of the rogue planet that causes the Earth such devastation during its periodic passage. ZetaTalk Prediction 6/1/2002: Solar Flares, an extended or anomalous solar cycle, has been planned for decades to be used as a distraction and excuse during this time. Solar flares are not anything man on the face of earth can recognize, thus can be made up freely as disinfo. Trust NASA, as they have the Hubble and probes and satellites, and will tell you what has occurred. Of course, they lie. What does all this mean? It means that any reason for the current weather, satellite failure, magnetic diffusion, or heating core along with volcanic and quake increases, are to be blamed on the Sun. Thus, you have confusion about the role of the Sun lately, such that it is surmised to be about to cause a pole shift, magnetic in nature, that will cause most of humanity to die off. Power outages occurred in 2003, when Planet X arrived in the inner solar system, wafting its gigantic charged tail past the Sun to engulf the Earth. On August 14, 2003 a massive power outage turned New York City black, causing a million commuters to walk home to suburbia silently across the bridges. This was blamed on an overload at the Niagara substation, but the cause was never established. A New York State official said the Niagara Mohawk power grid overloaded on Thursday, causing a massive power outage. A massive power outage swept across swaths of the eastern United States and Canada on Thursday, leaving sections of New York , Detroit, Cleveland and Toronto without electricity. It was not immediately clear whether the Niagara Mohawk problem caused the wider outage. 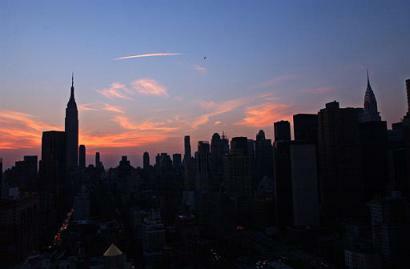 Canadian officials insisted a massive blackout Thursday across the Northeast and parts of Canada originated in the United States, though U.S. power workers denied that and American officials blamed Canada. Other massive power outages followed, occurring in London, Malaysia, the Yucatan peninsula, and Italy to name but a few. As with Niagara, these blackouts were related to electromagnetic surges, not equipment failure. Power went out in parts of the capital and southeast England Thursday, bringing much of the London Underground and many regional trains to a halt during evening rush hour. 60 percent of the subway system had been halted by the outage, including the majority of services in central London. London Underground said the problems were caused by a failure on the national power grid. EDF Energy, which handles some power transmission for London, said it had lost electricity for large parts of south London. A power outage today blacked out parts of peninsular Malaysia and temporarily disrupted operations at the country's main airport. The outage occurred around 10 AM in at least four northern states in peninsular Malaysia. Officials believed a problem with electricity cables might have triggered the outage. A power outage left at least 3 million Mexicans in the southern Yucatan peninsular without electricity. The blackout occurred before dawn in Mexico's southern states of Yucatan, Campeche, Quintana Roo and parts of Tabasco and Chiapas. The fault, which automatically shut down power lines, could have been caused by lightning or a mudslide. The 2003 Italy blackout was a serious power outage that affected all of Italy-except the island of Sardinia-for 9 hours and part of Switzerland near Geneva for 3 hours on 28 September 2003. It was the largest blackout in the series of blackouts in 2003, affecting a total of 56 million people. It was also the most serious blackout in Italy in 20 years. Are there clues from the establishment that the tail of Planet X is responsible? There is a cover-up, but every once in awhile the establishment slips. For instance when the breach in the Earth's magnetic field was described by NASA on December 16, 2008 as being exactly four times as large as the Earth. The diameter of Planet X is, per the Zetas, four times larger than Earth's diameter. For instance when National Geographic stated in a June 30, 2008 article that changes in the Earth's magnetic field have been noted since 2003, the year Planet X entered the inner solar system. Planet X is shown in ancient Sumerian and Egyptian drawings as a winged globe. This winged globe make an appearance on the SOHO C3 images on March 27, 2009 at 3:18 UTC. Neither the earlier nor later images had the winged globe at the 4 o'clock position, so it was a rare catch, but unmistakable. As can be seen from this Skymap image, on that date only Mercury should have been visible to the right of the Sun. 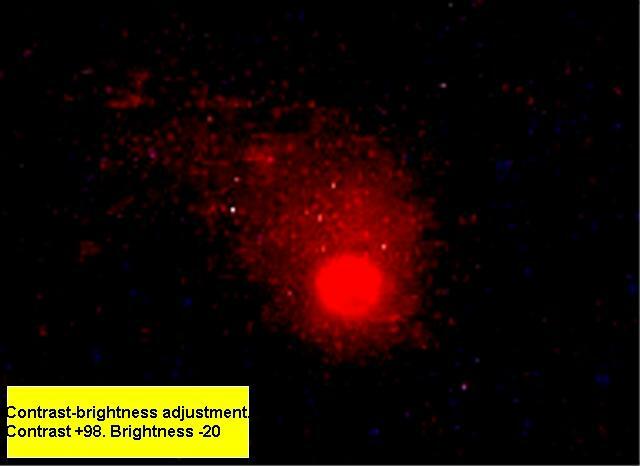 Planets, on SOHO, have the appearance of a bright orb with a slice of light to either side. The winged globe does not have this appearance, nor should any planetary object have been in that location on that date. The Zetas have stated that Planet X can be viewed, when a capture is possible, to the right of the Sun. ZetaTalk Description 12/27/2007: We have mentioned that as Planet X begins to turn the hose of magnetic particles from its N Pole toward Earth, that Earth would try to escape by moving as far to the left as possible, putting Planet X to the right of the Sun in the view from Earth. This places Planet X to the right of the Sun, in the view from Earth, where the angle is optimal for sunlight to reflect off the imposing Planet X complex - the corpus of Planet X surrounded by its close hugging dust cloud and moon swirls. This recent capture of the winged globe is consistent with earlier photo captures. When Planet X was inbound in early 2003 and could still be seen in the night sky as it had not yet been lost in the glare of the Sun, it did indeed give the appearance of a double helix with a tail swirl off to either side. The winged globe of legend. Déjà vu to the days of the Great Depression, tent cities have returns in force. Foreclosures, job losses, and overwhelmed social services are all factors. California Governor Arnold Schwarzenegger said a make-shift tent city for the homeless that sprang up in the capital city of Sacramento will be shut down and its residents allowed to stay at the state fairgrounds. Schwarzenegger said he ordered the state facility known as Cal-Expo to be used for three months to serve the 125 tent city residents, some of them displaced by the economic recession. California, home to one of every eight Americans, has been particularly hard hit by the housing market collapse after many residents turned to exotic mortgages to afford homes. The tent city, which has long existed along the banks of the America River, gained national attention last month when some of its recently homeless residents were featured on the Oprah Winfrey Show. The state has one of the highest rates of foreclosure. California home prices dropped 41 percent last month from a year earlier, more than double the US decline. Hardest hit are the children, who go to school (if they go at all) malnourished and poorly clothed, subject to ridicule from other children. One in 50 American children is homeless and the economic crisis hitting the United States will make the problem worse. The child homelessness crisis is the worst since the Great Depression, says the report, which looked at the years 2005-06 -- or before the economic slump had fully hit the United States. Children without homes are twice as likely to go hungry, more than twice as likely as middle class children to have health problems, and run twice the risk of other children of repeating a grade at school, being expelled or suspended, or not finishing high school. The report looked only at homeless families with children under the age of 18. Runaways were not included in the statistics, even if some are minors. Homelessness is widespread during this, our second Great Depression. Tent cities are springing north and south and coast to coast. While encampments and street living have always been a part of the landscape in big cities like Los Angeles and New York, these new tent cities have taken root - or grown from smaller enclaves of the homeless as more people lose jobs and housing - in such disparate places as Nashville, Olympia, Wash., and St. Petersburg, Fla.
A sign of the times, perhaps to become an increasing trend, are defensive measures. "If you ain't from here, don't camp here", seems to be the message in Orange County, California. Tent City residents gather as the city of Ontario starts the process of sorting out who may stay and who must leave. The city issued wristbands - blue for Ontario residents, who may stay, orange for people who need to provide more documentation, and white for those who must leave. The aim is to reduce the number of people living there from over 400 to 170. Officials begin thinning out the encampment, saying the city can provide space only for those who once lived there and can prove it. Per the Zetas, this type of lifestyle will be common after the pole shift - migration looking for a place that might be better off, and tent or shanty cities everywhere. ZetaTalk Comment 7/15/1995: On mainland China there are remnants of ancient civilizations, and the stories of their past glory seems to exceed the humble peasantry of today. Was there a great civilization that fell? Yes, as on all continents during the pole shifts, the devastation is so great that cities essentially are brought to dust. China of the past was in keeping with the Chinese people, who are intelligent and diligent. But their development was no more impressive than what they have today. Of course, there are places where today there is but a village, the inhabitants of which can scarce do more than tend to their fields for survival. And if there are traces that indicate a great city once stood nearby, one could postulate that mankind fell. However, after the pole shifts the few survivors regularly migrate, constantly, seeking to escape the gloom and constant rainfall which is everywhere. Of course the survivors disappeared. They went elsewhere. ZetaTalk Comment 2/15/2001: In countries where social services exist, those desperate for a rescue will begin to assume that the government will act, perhaps at the last minute but in time to rescue them. Announcements will be made to peacefully evacuate cities and coastlines, tents will be erected, and the populace resettled after it is all over with the worst of it the beans and rice endlessly served for supper. The military, politicians, and those holding stakes in the cities and coastlines being deserted will put selfish interests aside and become humanitarians, in the end. For those clinging to this hope for rescue, we would only point out that the governments today do not act in this manner, but leave many starving children and injustices in their wake, daily. Stressful times will not create heroes, it will create slamming doors. Simply stated, if any are looking to the governments to rescue them, and move close to government operations in the hopes this will occur, they will not only be disappointed, they will become slaves or worse at the hands of those determined to remain in control during the Aftertime.